I love the new year. Each December, I look forward to making resolutions and starting the year with a clean slate. This year, I am focused on things that are somewhat mundane. One of my most important goals is to stop procrastinating when it comes to annoying household tasks. On that front, laundry is a big issue. It is something I put off until absolutely necessary. In a four-person family, that means the clothing can really pile up. This year, I am going to make an effort to do laundry more frequently so that it is not such a daunting task when I finally get around to it. 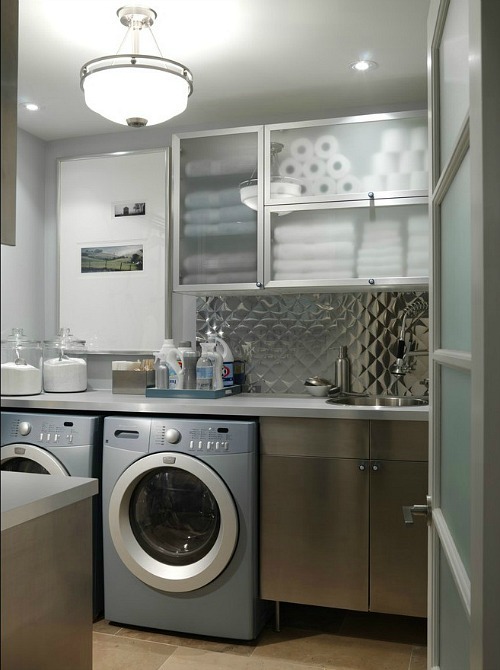 We are lucky, we have a dedicated laundry room that has a sink, folding area, cabinets and a drying bar. 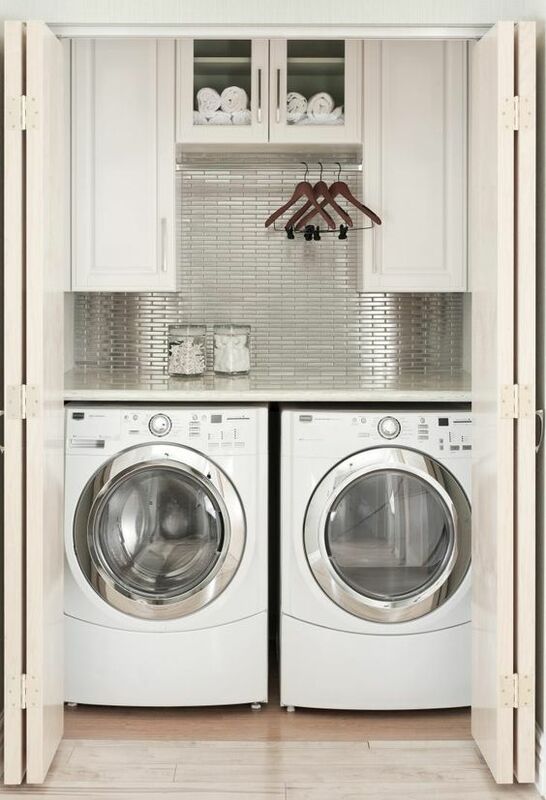 We have all of the elements of a great laundry space. Unfortunately, it has become a bit of a dumping ground for items that don’t have a home. Extra baskets, vases, and cleaning supplies have cluttered up the space. This month, my goal is to pull everything out and reorganize. It is time to start again. Of course, it doesn’t hurt to have a little inspiration. 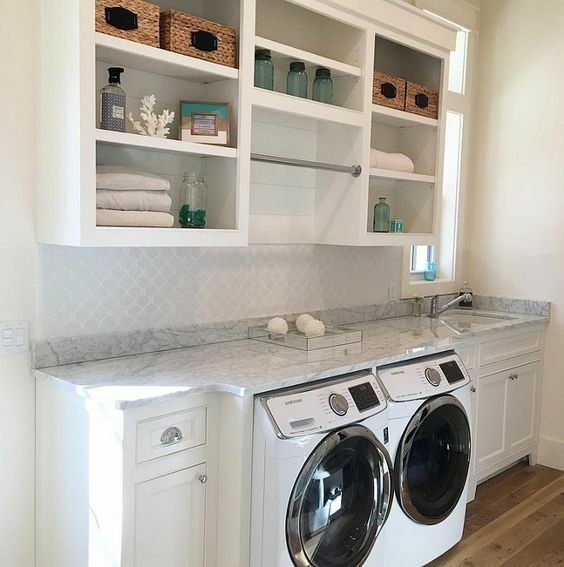 These laundry rooms are similar in design to that of our current space. A big part of having an organized laundry space is having appropriate storage. Of course cabinets help, but keeping smaller items contained in baskets, and having everyday items at hand is critical. All of the spaces above make use of baskets, jars and trays to keep clutter at bay. 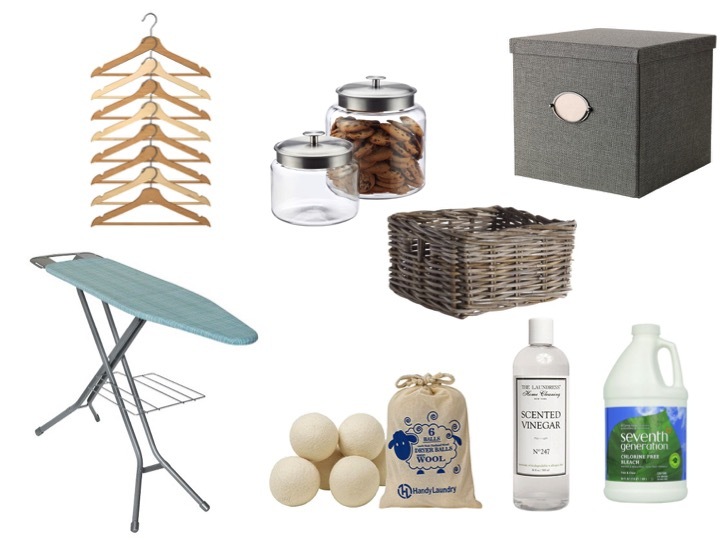 Here are some of the items on my list (including few critical laundry implements). And, for times when I meet a stain I can’t seem to beat (which happens frequently with my five-year old), I found this handy cheat sheet. I think I had better keep a copy right next to the washing machine. If you have the same laundry-procrasting issue that I do, I hope that you are feeling inspired to turn over a new leaf for the new year. Stay tuned for an update at the end of the month, including the before and after images of our space.